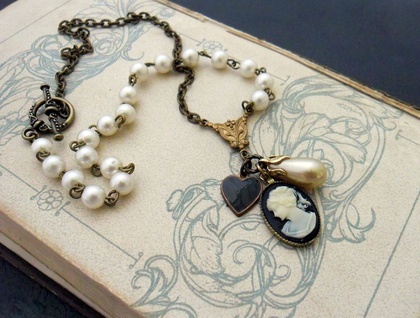 This unique, vintage-look cluster necklace features a vintage cameo in black and white, a repurposed faux pearl drop, and a black-enamelled copper heart charm from the 1940s. 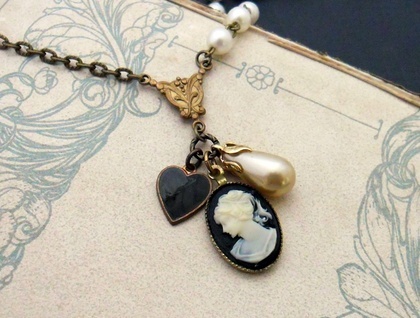 The cameo depicts a lady's head in white on a black background. It was once part of an earring, and the imitation, teardrop-shaped pearl was mostly likely too. All three of the charms are clustered beneath a brass connector with an ornate design. 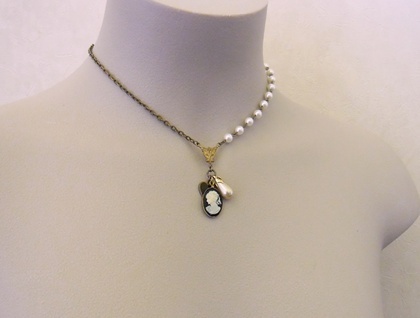 The connector joins the two halves of the necklace: antiqued-brass coloured chain with oval, textured links on one side; and an old strand of white acrylic pearls, linked together with brass wire, on the other. The necklace fastens with a fancy, antiqued-brass coloured toggle clasp. ‘Amelie’ is a one-off design, never to be repeated. This necklace is collar length on most people – as shown on Zara the mannequin – but can be shortened to almost a choker length if you would like. Please check the below measurements carefully to find where the charm cluster will sit on you. This necklace is not designed to sit lower than the collarbones, and cannot be lengthened. The necklace chain measures 41.7cm, including both halves of the toggle clasp. When worn, the distance from the top of the brass connector to the bottom of the cameo measures 49mm. The cameo measures 19mm lengthwise, not including the little hanging loop at the top, and 14mm across. 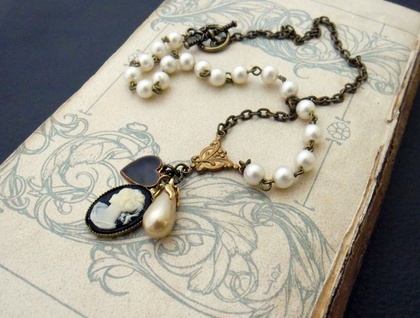 The little black heart is 11mm across, while the old faux pearl is 19mm long, including its leafy, gold-coloured cap.